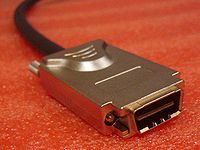 (MiniD68 HPDB68 Ultra wide SCSI-3/ Ultra2 LVD SCSI/ wide Differential SCSI both internal and external) The internal and external connectors appear to be different, but they are the same basic connector. The easy way to tell the difference between an HD50 and an HD68 (unless you want to count those tiny little pins) is to measure them. HD50 is about 1 3/8” (36mm) , and the HD68 is about 1 7/8” (47mm). 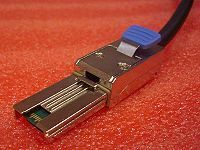 VHDCI 0.8mm HPCN68 male- Sometimes called SCSI-5. Very popular in RAID cards.